After 17 days here at LCO Jared and I are heading down today. Overall the “unpacking run” was a success. with the leadership of Armando and Marco (Arcetri) with Mario and Frederico (Microgate), and Rich (Arizona) we unpacked, flipped, cleaned, clocked, and installed the shell on the ASM. Victor (Arizona) prepared a special wedged interface plate that exactly positioned the ASM on the mount in the correct X, Y, Z, and ThetaX, ThetaY to match the optical axis of Magellan (thanks to Tyson and Juan for help with the final adjustments to this complex interface plate). The TSS shell safety system was (for the first time) made fully operational. The ASM was fully characterized with the windscreen on. All ASM tests and calibrations were redone and the ASM is perfect working condition. /uncategorized/asm-performancesverification/ for summary details and plots. 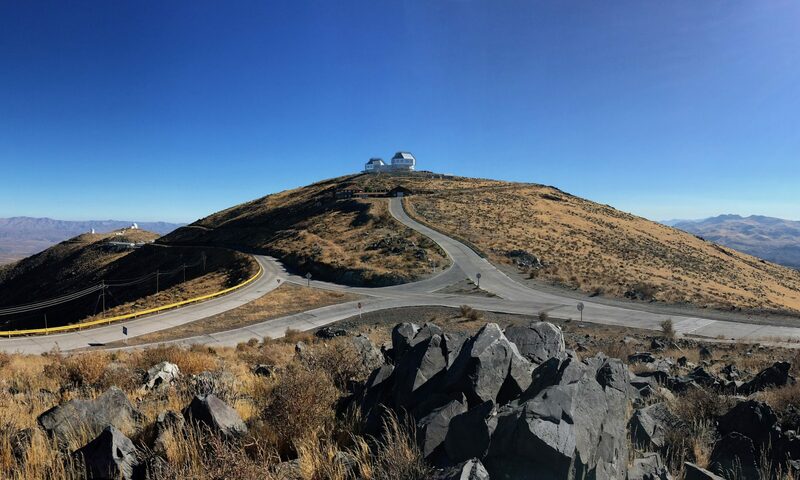 Also from Carnegie Tyson and Alan (with lots of help from Povilas, Juan, and the excellent technical support from the rest of the LCO and Magellan Staff) were able to install and successfully test the active optics guider on the ASM. for a movie of the guider moving from the center of the field to its “off” position as it hands off the guide star to AO. Jared (Arizona) and Laird worked hard at aligning the PWFS optics, testing, and final cabling of the PWFS. For the first time the whole system was tested with all the electronic racks (and their internal fans) mounted on the NAS with the PWFS. The vibration damping system of Tyson seemed to work well –as there were no vibrations from the fans seen by the PWFS (or VisAO CCD). This is a big relief. All the PWFS optics were aligned as well as they were during PSR in Italy (they were also given a much needed cleaning). Also we can now reach our goal 4.3 electrons of read noise in our most sensitive CCD39 mode (with all components powered). There doesn’t seem to be any addition noise from any of the other components or motors. This is also a big relief. Jared worked hard on the VisAO camera and computer. The one disappointment of the run was that the motherboard of the VisAO computer was likely damaged while mounting it on the NAS (for the second time). Perhaps even more annoying was that Jared’s spare motherboard also failed! However, Magellan kindly let Jared borrow a spare computer and he was able (in a day) to have the whole system up and running again on a rebuilt computer! The VisAO camera had some work done it as well. We installed a new gimbal mirror, Derek’s new ND3.22 in the coronagraph wheel, and cleaned and tightened up the optics. Derek’s new baffle tubes were also installed. Also we installed a new “off-sky” fiber laser alignment system that works quite well. Overall, we made the sharpest images yet with the VisAO camera (0.02 arcsec) and we are ready for commissioning in November. Also the noise and sensitivity were nominal for the CCD47 as well. Jared and Glenn (Magellan) worked on making sure the AO system’s AOI software could talk to the Telescope’s M1, vane ends, and mount (for offloading Astigmatism, coma, focus, and Tip-tilt). Good progress was made on that front. The success of this run required the help and cooperation of a great many people. Despite transporting 17 boxes halfway around the world not one item was damaged by the trip! This is testament to the excellent handling and packing of the items — many people helped in this, I’d like to especially thank Roberto, Dave, and Povilas (LCO), Edilia (CTIO), Earl (OCIW), Ganni (Fiorino shipping), and Runa, Carmelo, Armando, Marco (Arcetri) for a great (and surprisingly complex) shipping job! Also I’d to thank Dave, Miguel, Mark, Povilas and the whole LCO crew for being so incredibly helpful and responsive throughout this whole period. Things are looking good for first light in November. PS — I’d also like to thank Jared and Marco for keeping this blog up to date and so interesting for the whole run! We said goodbye to Armando and Marco this morning. Thanks for the hard work guys. See you in November. After they left, Laird and Jared spent the rest of the day covering optics, organizing the cleanroom, backing up disk drives, and generally getting everything presentable. Not quite the way we found it, but presentable. We’re heading down to La Serena on the 1130 transport tomorrow. On my way to bed last night I suddenly found myself in the middle of the horse herd. This was the best photo I could get by moonlight. The herd was just outside the ASB this morning. As we were walking down for lunch this one took off after his buddies. Once he caught up there was some rough housing. The big accomplishment of the day was finally catching our own glimpse of the famous vizcacha who lives over our clean room. The cleanroom vizcacha soaking up some sun. He or she kept a close eye on us. Quite a glare actually. Click for full resolution. Next time, this is where we work. Over two weeks in and we still have plenty to do. In the morning we mounted the calibration return optic (CRO) truss and the CRO itself, to make sure they still fit. The CRO truss mated to the windscreen. In the afternoon the ASM was unplugged, and wrapped up for safe keeping while waiting for our turn on the telescope. Marco and Armando wrap the ASM in plastic to keep it dust free over the next 5 or 6 months. The ASM will stay like this, waiting for us to come back. Glenn and Jared connected our software to the telescope network today, and tested our communication protocols on a real telescope control system (not connected to a telescope, of course). We found a few error handling bugs on our side, but otherwise it went very smoothly. Our software works! Glenn Eychaner making the change that allows MagAO to connect to the system. And finally, after dinner Laird and Jared spent some time playing with the VisAO camera. We have only ever found time to do this a handful of times – we are usually too busy worrying about the WFS or the ASM or some plumbing issue. We put a new fiber on our alignment laser, which passes the laser’s 630nm light. Previous fibers have corrupted the light too much at this short wavelength. This one worked great, and we were able to take 2.7 pixel images. This is exactly what we expect for our camera imaging a 4.3 micron wide fiber. This corresponds to 20.0 milliarcsecond FWHM on sky at Magellan with our system – amazing! After that, we started playing with our coronagraph. We have small a metal dot which we can place almost right in front of the CCD47, which we use to block the bright core of starlight. This screenshot shows our 630 nm source aligned on our occulting spot. (The yellow line is from our image viewer). Note that this is in the lab with no AO. And returning to our obsession with repeatability, we took a video of slewing our gimbal mirror off the coronagraph and back on. This stability will be extremely important on sky so that we don’t spend time re-aligning on the spot. We don’t have any animals tonight. I tried to get some bird pictures, but couldn’t get close enough and it would be hard to top the Vizcacha from yesterday. Here’s a shot of LCO from the west. From the left that's a small telescope used to monitor seeing, the shadow is the 100" inch, the Magellan telescopes are on top, and then we have Telescopio Polaco, and the 40 inch.